For moi? Thank you, Kate! 1. Post your top five books of all time. 2. 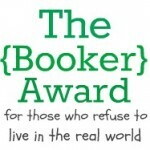 Post the Booker Award icon. 3. Nominate other bloggers to do the same. Had to put a couple of childhood favourites in there. Still love them now.